Ritika - yup it is healthy now...safe, sound and jumping around - survived the drowning attempt :D :D You search for same shade naa...the first coat might look a bit odd..but the next coat will sort it out. Appu - Haa..I know those aunty colours...I don't like those. 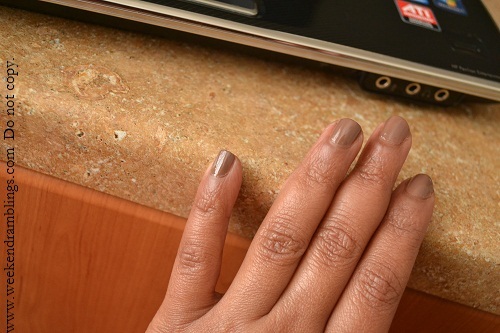 This shade, I am not too sure, but I think it might be a passable dupe for a Chanel nail polish - Particulere. Oh..I don't know where you stay..a friend of mine in Bangalore is an Avon rep and she could courier. wearing lilac of colorbar and i refuse to remove it....thkfully it has survived a whole week without chipping and am very impressed !!! ohh i have the same shade.. its soo elegant nd lovely ! Your profile pic is so cute!! Looks very nice on you, Rads. is quite pretty radhika.. i will order it with my next order. :D I know someone who wears only such shades.. They look quite elegant. It would suit formal offices too na? haan it would .,. i liked the shade.. soft elegant kinds. 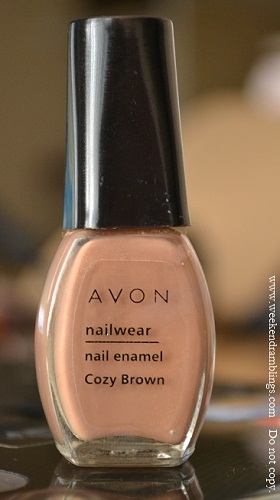 I like it.. it is not overwhelmingly brown... good toenail shade. guess I like some aunty shades :). Am wearing an elle 18 that looked nice in the bottle, but not so great applied. Forgot the shade name...it is a kind of silvery puce pink...ugh. Will take it off asap, hate it the more I look at it.